Both the Panzer I and II were considered as stopgaps before the arrival of more advanced models, namely the Panzer III and IV. Despite of this, the Panzer II remained in service throughout the war, being the main light tank in German service and being used as a scout, although many wheeled vehicles preformed this specialized task far better. In this particular role, the Panzer II lacked both speed and range. It was gradually improved and produced until 1943, as no satisfactory replacement was ready in time. The origins of this model date back to 1934, when it became apparent to the Waffenamt (military ordnance bureau) that delays in the production of the Panzer III and IV led to the need of a new design to quickly replace the Panzer I. The specifications required a 10 ton tank with a 20 mm (0.79 in) autocannon. Krupp, AG, Daimler-Benz, MAN, Henschel, Sohn AG were contacted, and submitted their designs to the Waffenamt in 1935. The Krupp design was rejected, and a marriage of the Daimer-Benz hull and MAN chassis was chosen instead. This led to ten prototypes during late 1935, initially named LaS 100. Production was approved the same year. Basically, the accepted design was an enlarged Panzer I with a turret bearing the new Rheinmetall KwK30 L55 20 mm (0.79 in) quick firing gun. The armament was derived from the 2 cm FlaK 30 anti-aircraft gun, capable of a firing rate of 600 rpm. The purpose of such a gun was to have good armor-piercing capabilities, due to its high velocity and high rate of fire, being especially effective at short range against most light and medium tanks of the time. The KwK 30 was aimed through a TZF4 gun sight. Normal provision was 180 rounds (armor-piercing and high explosive) and 2250 for the coaxial 7.92 mm (0.31 in) Rheinmetall-Borsig model 34 machine-gun. Elevation/depression for the gun mount was +20/-9.5°. As the Spanish Civil War showed, a dramatic increase in armor was urgently needed, and the first designs incorporated integral 14 mm (0.55 in) homogeneous steel armor (10 mm/0.39 in top and bottom), which was sufficient against shrapnel and bullets. However, it was not immune to many high velocity 37 mm (1.46 in) AT weapons of the time, or the French 25 and 47 mm (0.98-1.85 in) and Soviet 45 mm (1.77 in) towed antitank guns. The engine of nearly the entire series was the gasoline 6-cylinder Maybach HL62 TRM providing 140 hp, coupled with a ZF transmission with 6 gears plus reverse. It was reliable, although it limited any major increases in armor and armament, due to significant losses both in speed and range. The first pre-series vehicles were fitted with small wheels sprung in pairs under three bogies, a system very similar to the Panzer I suspension. However, for reliability and mass production, a new system of five individually sprung, larger wheels was chosen. The upper part of the track was supported by three return rollers, increased to four on the production version. The crew-size of three was a progress over the Panzer I, but the commander was also the main gunner, sitting on the turret seat. The driver sat at the front of the vehicle. The loader/radio operator was situated on the floor under the turret, operating a FuG5 USW receiver and 10-watt transmitter. The radio gave a clear advantage to the Panzer II over previous models and foreign opponents. In January 1934 the German tank design office of the weapons testing ordnance department Waffen Prüfwesen 6 (Wa Prw 6) issued specifications of a new tank chassis they wanted built, code name La.S.100. Weapons manufacture Maschinenfabrik Augsburg Nürnberg AG, (M.A.N.) built a prototype La.S.100 tank chassis. They were in competition with two other German companies Fried.Krupp Abt.A.K. and Henschel. M.A.N. was awarded the contract to build the chassis of the new Panzer II light tank based on their prototype La.S.100 chassis. Daimler-Benz designed the superstructure and turret. It is wrong to dismiss the Panzer II tank of 1936 as a poor design when comparing it with more heavily armed and armoured tanks of WW2. The tank’s armour could protect its crew from small arms fire and 7.92 mm S.M.K steel-cored armour-piercing machine gun bullets fired from a range of 30 m. It was designed to engage enemy machine gun nests and destroy them to enable the infantry to continue to advance, not to engage in tank on tank combat. The tank’s 2 cm Kw.K.30 L/55 gun could knock out Soviet T-26 and BT tanks but the crews were aware that the Panzer II tank’s armour would not stop a 3.7 cm or 4.5 cm anti-tank gun. The high nickel-alloy, rolled homogeneous-hard armour plate ranged in thickness from 5 mm to 13 mm. It was welded together not riveted as seen on many other tanks of this time-period. This made it stronger and lighter. The first Panzer II Ausfuehrung (model versions) were given the lower case letter ‘a’ then ‘b’ and ‘c’. Later versions were given capital letters ‘A’, ‘B’ and ‘C’. This can be confusing. The Panzer II Ausf.a tanks was sub divided into Ausf.a/1, Ausf.a/2 and Ausf.a/3. Each version having minor mechanical changes. Early versions of the Panzer II changed shape over time as they were upgraded during their operational life. Additional armour was added and features like cupolas were fitted. Panzer II tanks were not used in the Spanish Civil War. They first saw combat in Poland, 1 Sept 1939. The thickness of armour on the Panzer II Ausf.b tank’s chassis, superstructure and turret was increased from the Ausf.a tank’s 13 mm to 14.5 mm. The gun mantle increased from 15 mm to 16 mm. To reduce the reliance on obtaining nickel, the armour was changed to rolled homogeneous nickel-free armour steel. It had the same resistance to 7.92 mm S.M.K steel-cored armour-piercing machine gun bullets fired from a range of 30 m as the Ausf.a but it had to be thicker to achieve this. This increased the weight of the tank by 500 kg but it did not decrease its speed. The shape and thickness of the crew’s vision ports were changed to give added protection. A different style of large drive wheel was bolted on to the final drive at the front of the tank. The rear engine deck was redesigned. Armoured louvers were added to the rear right of the tank. The road wheels and the track return rollers were widened. The return rollers were reduced in diameter. Wider tracks, increasing from 260 mm to 285 mm, were introduced. Lengthened, foldable track guards were fitted to the rear of the tank. The 2 cm Kw.K.30 gun could fire three different shells. When fired against armour plate laid back at 30° from the vertical. The PzGr.39 (Armour Piercing) shell could penetrate 23 mm of armour at 100 meters and 14 mm of armour at 500 meters. The PzGr.40 (Armour Piercing Composite Rigid) shell could go through 40 mm of armour at 100 meters and 20 mm of armour at 500 meters. It could also fire 2 cm Sprgr. 39 (High Explosive) shells. The suspension on the Ausf.c was visually very different from that used on previous models. Five larger 55 cm diameter road wheels replaced the six small road wheels. The suspension was now a leaf spring, crank arm system. The long metal beam that ran along the road wheels was no longer needed and was removed. The new version of the front drive wheel first introduced on the Ausf.b was kept. An additional track return roller was added bringing the total to four. The front track guard extension was now held together with a by clips. This increased the total weight from 7.9 tons to 8.9 tons. This did not affect the tank’s top speed as the engine was upgraded as well. It was fitted with a more powerful Maybach HL 62 TR 6-cylinder water cooled 140 hp petrol engine. Early versions of the Panzer II changed shape over time as they were upgraded during their operational life. Additional armour was added and features like cupolas were fitted. The bullet ricochet ‘splash’ plate and the dummy cone shaped periscope in front of the commander’s hatch were removed. The additional armour added to the front hull glacis plates changed the look from a curved frontal armoured hull to an angular shape. Panzer II tanks were not used in the Spanish Civil War. They first saw combat in Poland, 1 Sept 1939. The Panzer II Ausf.A was the final standardised version ready for mass production. The previous versions Ausf.a/1, a/2, a/3, b and c were all trial series developed to test new design elements. This is why a capital letter ‘A’ was used to denote the tank version. Only minor internal changes were made. A new gear box was fitted. The fuel pump, oil filter and cooler were relocated on the engine. The tank’s electrical system was supressed to try and stop it interfering with the AM radio reception and transmission. The man visual difference between the Ausf.c and the Ausf.A was the introduction of a new driver’s visor at the front of the tank. The large flat rectangular armoured vision port cover was now replaced with a V shaped armoured visor that had a slit built into it. The two side visors used by the driver and radio operator were now of the same type. The first modification fitted to the Ausf.A was a turret ring guard bolted on to the superstructure at the front and rear of the turret ring, to help deflect incoming enemy armour piercing bullets and shell shrapnel. There were no major changes between the Panzer Ausf.A and the Ausf.B. There was a delay in finalising the design of the Panzer III tank to enable it to be mass produced. To fill this gap more Panzer II tanks were ordered but with a few minor alterations like vertical bullet deflectors welded to the sides of the superstructure in front of the vision ports. 50 mm thick bullet proof glass were bolted behind the vison slit. During the production run strengthening reinforcing rods were added to the hull and angle irons were welded inside the engine compartment. Early versions of the Panzer II changed shape over time as they were upgraded during their operational life. Additional armour was added and features like cupolas were fitted. The bullet ricochet ‘splash’ plate and the dummy cone shaped periscope in front of the commander’s hatch were removed. The additional armour added to the front hull glacis plates changed the look from a curved frontal armoured hull to an angular shape. Some were fitted with a smoke grenade rack on the battlefield. The Panzer II Ausf.B tanks sent to North Africa had extra armoured plate bolted onto the gun mantel in addition to the extra hull armour. A large stowage bin was fixed over the right track guard. Panzer II tanks were not used in the Spanish Civil War. They first saw combat in Poland, 1 Sept 1939. The Ausf.C was ordered to keep the factories busy until the Panzer III tank was ready for mass production. The only visible difference is a new type of improved vision port. It had two conical beaded bolts of the face plate and two large bolts above and below it to keep the 50 mm bullet proof glass in place. It was still armed with a 2 cm Kw.K.30 L/55 main gun that could fire armour piercing AP shells and high explosive HE Shells. The turret was also fitted with a 7.92 mm MG34 machine gun. Early versions of the Panzer II changed shape over time as they were upgraded during their operational life. Additional armour was added to the front of the tank’s hull and turret in 1940. When the commander’s cupola was fitted in 1941 the bullet ricochet ‘splash’ plate and the dummy cone shaped periscope that used to be in front of the commander’s hatch were removed. The additional armour added to the front hull glacis plates changed the look from a curved frontal armoured hull to an angular shape. The Pz.Kpfw Il light tanks were first issued to Panzer units in the spring of 1936. Panzer II tanks were not used in the Spanish Civil War. They first saw combat in Poland, 1 Sept 1939. They were used as main combat tanks in Poland but on 10 May 1940 they were relegated to reconnaissance roles during the invasion of Belgium, Holland and France. During the invasion of Russia, Operation Barbarossa, 22 June 1941 most Panzer units had a platoon of Panzer II tanks for scouting reconnaissance missions. The platoons were withdrawn in 1942 and tanks were phased out from panzer regiments in 1943. They were still used for internal security work until the end of the war. The Panzer II Ausf.F was built with the thicker 30 mm armour on the front of the tank hull and 30 mm armour of the front of the turret. It was not added on later as in previous earlier models. The Commander had a cupola with a periscope on the top of the turret rather than a split hatch. The side vision ports had vertical bullet splash guards in front of them and had two conical bolts above and below the visor to hold in place the 50 mm bulletproof glass behind it. The turret dummy periscope and commander’s hatch bullet splash guard were not fitted. The turret ring was protected from bullet and shrapnel damage by a triangular shaped guard welded to the top of the superstructure at the front and back. The turret was fitted with a rear stowage bin. A fake armoured visor, made from aluminium alloy, was bolted onto the front of the hull to the right of the driver’s vision port. This was done to distract enemy fire away from the driver. Most other parts used to build the tank were unchanged from previous models. It was still armed with a 2 cm Kw.K.30 L/55 gun and 7.92 mm MG34 machine gun. The first seven Panzer II Ausf.F light tanks were completed in March 1941. Production stopped at the end of July 1942. A total of 1,004 received chassis numbers and entered service. They were used mainly on the Eastern Front as a reconnaissance tank but some Panzer II Ausf.F light tanks were sent to Libya as replacements. In the desert, they were issued to the 2nd Battalion, 5th Panzer Regiment, 21st Division (II.Abt/Pz.Rgt.5). These tanks had the size of the cooling air intake and exhaust holes increased and the radiator fan changed for a high-performance version so it could cope better with the hot desert temperatures. Late production tanks built in 1942 had four posts fitted around the turret cupola to be used as a base for a Fla-M.G anti-aircraft machine gun. The rear turret stowage bin does not seem to be fitted. The leaf spring suspension on the Panzer II Ausf.c and Ausf.A-C tanks were found to have a limited life span of 1,500 – 2,500 km before they needed changing. A new torsion bar suspension system with larger road wheels and a different drive and idler wheel were introduced on the Panzer II Ausf.D and E. It was designed by Maschinenfabrik Augsburg-Nürnberg (MAN). No track return rollers were used. The seven Ausf.E chassis had different wheels. They were used for trials, never as combat tanks as no turret or superstructure was fitted to them. A new Maybach HL 62 TRM engine and a new Maybach Variorex VG 102128 7-speed gearbox enabled this heavier Panzer II Ausf.D tank to reach top speeds of 55 km/h. Fuel tanks were moved into the engine compartment. The rear engine deck was completely changed. The armoured deck now covered the width of the tank and had two large split hatches in it. One of the major differences was that the radio operator now has his own armoured forward vision port and hatch at the front of the tank. The triangular aerial support on the left of the tank was removed and the aerial positioned on the right side of the vehicle. There are no vertical bullet splash shields in front of the side late version vision ports. There are conical shaped bolts above and below the armoured side vision ports to hold in place the 50 mm thick bullet proof glass. The front hull armour was now 30 mm thick and of an angular rather than a curved design. The turret armour was still 14.5 mm. It had a split hatch and dummy periscope cone and bullet splash guard in front of the hatch. All Panzer II Ausf.D tanks that survived Poland and the invasion of France were converted into 7.62 cm Pak 36(r) Marder II (Sd.Kfz.132) tank hunters following an order issued 20 December 1941. In the summer of 1938, the German Army (Heer) authorised the development of a new model of the Panzer II light tank in an effort to create a more mobile armored fighting vehicle that could supplant its technologically inferior predecessors in the Panzer Divisions. This would become the failed Panzer II Ausf.G. The Panzer II Ausf.H and Ausf.M only reached the prototype stage. They did not enter mass production or see active service. They would have 30 mm thick armor on the front of the hull and turret but the side and rear armor was going to be increased from 14.5 mm on previous Ausf.G models to 20 mm thick. The company MAN was contracted to design and build the chassis whilst Daimler-Benz manufactured the superstructure and turret. To cope with the weight of the armor a more powerful Maybach HL 66 P 200 hp engine was fitted. On 27th March 1942, the decision was made to stop any further work on the Panzer II Ausf.H and Ausf.M designs in preference to the preferred Panzer II. Ausf.L Luchs (Lynx). Instructions were given to MAN and Daimler-Benz to build a strengthened Panzer II tank, which would become the Panzer II Ausf.J. The frontal armour on the hull and turret was increased from 30 mm to 80 mm thick. The sides and rear of the turret and hull were increased from 14.5 mm to 50 mm thick. It was armed with a 2 cm Kw.K.38 gun and a 7.92 mm MG34 machine gun in the turret. The commander had a cupola on top of the turret. In 1938, the German company Maschinenfabrik Augsburg Nürnberg (MAN) and Daimler-Benz were awarded the contract to design a new version of the Panzer II light tank for reconnaissance missions. They had already produced a three man Panzer II: MAN worked on the chassis and Daimler-Benz constructed the superstructure and turret. They then moved on to develop a four-man version that would become the Panzerspähwagen II (2 cm Kw.K.38)(Sd.Kfz.123) also known as the Panzer II Ausf.L ‘Luchs’ (Lynx). Panzerspähwagen and Panzerspaehwagen in English means armoured car. The first prototype chassis was completed in July 1941. In June 1942 it was tested against two Czech built light tanks the Skoda T 15 and 38(t) n.a. tank. The Luchs was found to be the better design, with a larger turret and better ground clearance. During the trials the engine, clutch and transmission functioned without problems over different terrains. The Maybach 180hp HL 66 P water-cooled petrol engine had enough power to enable the tank to have a top road speed of 60 km/h. The front armour on the turret and chassis was 30 mm thick. The side and rear armour was 20 mm thick. The turret was armed with a centrally mounted 2 cm KwK 38 main gun with a 1.3 m long anti-aircraft gun barrel and a coaxial 7.92 mm MG34(P) machine gun which had an armoured sleeve to protect the gun barrel. The gunner sat on the right of the turret which was a different layout to most German turrets. The Maybach HL 66 P water-cooled 180 hp petrol engine produced enough power to give the tank a top road speed of 60 km/h. Production of 2 cm Luchs began in September 1942 and finished on 7 January 1944: only 100 were built. They were used on the Eastern Front and the Western Front in Normandy. The Sd.Kfz.121, also known at first as the VK 6.22, was a new stopgap tank design. Here is one of the pre-series Ausf.a3, with a longer hull and other improvements over the Ausf.a. They were involved in the large training exercises in 1937, then deployed during the Austrian and Czechoslovakian annexations. They fought in Poland, Norway and France, and then were phased out as training machines. Here is an Ausf.b operating with the 36th Panzer Regiment, based at Putloss in Schelwig-Hosltein, part of the German expeditionary force, Operation Weserübung, March 1940. The following Ausf.c was the most accomplished version of the entire pre-series, with twenty-five being built. The mass-produced A, B and C versions were closely based on it. The Panzer II Ausf.C had five larger independently sprung road wheels rather than the six smaller road wheels of the earlier versions. An Ausf.C during the campaign of France, belonging to the famous 1st Panzerdivision, part of Guderian’s XIXth corps, which made the breakthrough in the Ardennes, May 1940. Panzer II Ausf.C Beobachtung (command tank), Russia, Group army center, April 1942. An Afrika Korps Panzer II Ausf.C, attached to the famous XXI Panzerdivision. Along with the XVth Panzerdivision, these units were brilliantly led by Rommel from Libya to Egypt. These Panzer II Ausf.Cs were “tropicalized”. This included better ventilation slits for the crew and the engine, and extra fixations for storage of any kind (spare parts, water and gasoline jerrycans). Ausf.C in Russia, operation Barbarossa, 7th Panzerdivision, July-August 1941. An Ausf.C in plain white paint winter livery, Heeresgruppe Süd (Army group south, General Gerd Von Runstedt), 13th Panzer Division (Sixth army, IIIrd Panzer Corps) under General Fretter Pico’s command, Caucasus, December 1941. Panzer II Ausf.F, XVth Panzerdivision, El Alamein, June 1942. Panzer II Ausf.F, Xth Panzerdivision, Djedeida, Tunisia, December 1942. Camouflage patterns became commonplace in this new landscape. Panzer II Ausf.F, unknown unit, Kharkov, 1943. A Panzer II Ausf.D of an unknown unit, Poland, September 1939. The Ausf.D and E only differed by minor details in their drivetrain. This Christie-inspired transmission system proved so unsatisfactory off-road that the next Ausf.F reverted back to the standard Panzer II suspension. The Panzer II(F), better known as Flamingo, official designation Sd.Kfz.122, was a conversion of existing Ausf.D/E into flame-thrower tanks. They were almost exclusively used on the Eastern front. Here is a Flamingo in white livery, at Stalingrad, December 1942. The Panzer II Ausf.L or “Luchs” (Lynx), the most famous reconnaissance tank of the Wehrmacht and the final version of the Panzer II. Its new hull, new drivetrain and engine, new tracks and interleaved wheels, new suspensions, better armor, radio and internal equipment, made this model well suited for the task. Here is a prospective view of the Vk 16.02 Leopard, as it would have been in regular units by the fall of 1943. But, compared to the cost and use of the Sd.Kfz.234 “Puma”, the project was doomed. Many Panzer II chassis, particularly those of early versions (Ausf.A to C) were used for special versions. And the production line, which stopped producing the Panzer II, kept churning chassis for the production of new variants. On 21 January 1939 the Waffenamt, (weapons department of the German military) suggested that flame thrower tanks be built using the Panzer II Ausf.D tank chassis. Between April and August 1939 forty-six new Panzer II Ausf.D tank chassis were diverted from the main tank production line and converted into a Flammenwerfer (flame thrower). An order dated 8 March 1940 resulted in an additional forty three Panzer II Ausf.D tanks, that had been issued to front line Divisions, being recalled and converted in to Flame thrower tanks. Confusingly these Ausf.D tank chassis were renamed Panzerkampfwagen II (Flammenwerferwagen) Ausf.A. They did not use the Panzer II Ausf.A suspension. It had the new Panzer II Ausf.D torsion bar suspension system with larger road wheels and a different drive and idler wheel. It did not use any track return rollers. The tank was armed with two flame guns housed in separate armoured towers built over the front left and right track guard. The tank commander operated the right flamethrower and machine gun. The radio operator controlled the left flamethrower. The gun’s fuel was kept in external armoured tanks mounted on each track guard behind it. The turret was redesigned. It was now only armed with a single 7.92 mm MG34 machine gun in a central ball mount flanked either side by two armoured vision ports. A few Panzer II (F) Ausf.A flamethrower conversions used the Panzer II Ausf.E tank chassis that was similar to the Ausf.D but had different wheels and tracks. A new contract for more flamethrower tanks was reported as having been issued 1 March 1941. These were known as Panzer II (F) Ausf.B. They still used the Panzer II Ausf.D tank chassis but had different idler and front drive sprocket wheels. They were not enough built in time for the invasion of France and the Low Countries 10 May 1940. There are photographs showing them practicing getting on and off invasion barges in the English channel during the summer of 1940 for Operation Sealion. They first saw combat on the Eastern Front during Operation Barbarossa, the invasion of the Soviet Union, 22 June 1941. Total build was 92 Ausf.A version and 250 Ausf.B. The most famous derivative was this successful tank hunter, using captured Soviet 76 mm (3 in) AT guns (Sd.Kfz.132) or the regular German Pak 40 (Sd.Kfz.131). 744 of both versions were built or converted until 1944, and they served well until 1944. The Wespe (Wasp) was a frontline self-propelled howitzer motor carriage, officially named “Leichte Feldhaubitze 18 auf Fahrgestell Panzerkampfwagen II”. 682 were built by Alkett from 1942 to 1943. They served with various Panzerartillerie Abteilungen on the Eastern front and North Africa, alongside heavier SPGs like the Hummel and Bison. Some were later converted as ammunition supply tanks (Munitions Selbstfahrlafette auf Fahrgestell Panzerkampfwagen II). Another, heavily modified version officially named “15 cm sIG 33 auf Fahrgestell Panzerkampfwagen II (Sf)”. This was another attempt to self-carry the gargantuan 150 mm (5.9 in) sIG field howitzer. The Panzer I Ausf.B served as the first basis for such a conversion, but it was soon found to be overloaded. A new, lengthened and reinforced chassis with extra wheels was designed, based on a regular Panzer II Ausf. B chassis. This led to the final Fahrgestell Panzerkampfwagen II. However, only 12 were completed by December 1941, and sent to the Afrika Korps. They were in the Engineers section of 7th Panzer. What looks like a white cross in the photo is a Yellow cross bordered in white. They were painted on the vehicles to prevention ‘friendly’ fire incidents due to the unusual silhouette of the Brükenleger II. From 1936 to 1939, as the production gradually increased, the Panzer II were used for the drilling of the Panzertruppen. Many of the officers involved became unit commanders afterwards. Some seem to have been sent in Spain, for testing purposes with Panzer Abteilung 88 of Legion Condor, but this is unconfirmed. The first war operation came with the Czechoslovakian annexation, almost without a fight. More serious actions took place during the Polish campaign, in September 1939. The Panzer II was, at that time, the most numerous model in the Werhmacht, with 1223 units. War operations showed that, while it was efficient against most lightly protected tankettes, many were destroyed by the Polish infantry AT rifles and the modern 7TP light tanks. 83 in all were destroyed, including 32 at the battle of Warsaw. Soon enough, there were concerns that they should be withdrawn as frontline combat tanks. Others were sent in Norway, were they played their part without serious opposition from the Allies. The French had landed there two independent tanks battalions, 30 Hotchkiss H35/39s in all, but they never encountered any German tanks. At peak deployment, the Germans had 63 tanks in Norway, mostly including Panzer Is, IIs and only three heavy Neubaufahrzeug. Two Panzer IIs were lost to enemy AT guns. 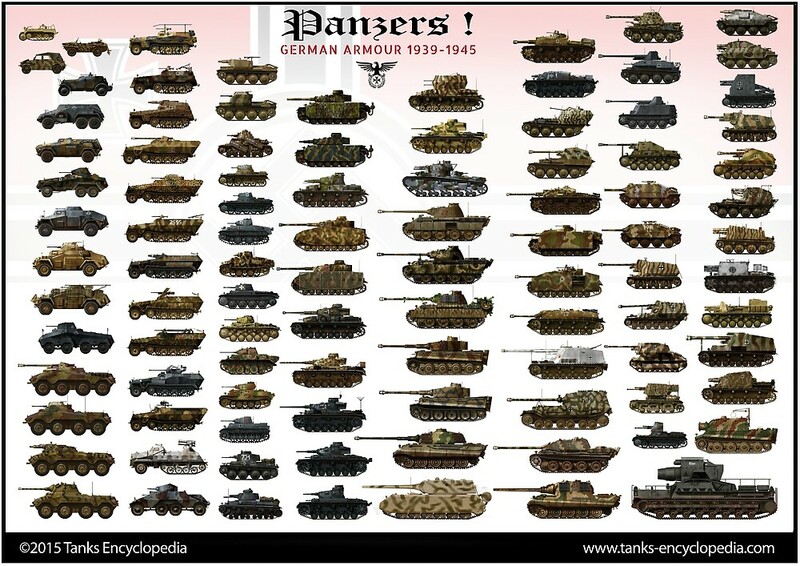 At the start of the campaign of France, all available Panzer IIs (920) were gathered. The crews were concerned by their opponents’ armor and weaponry. However, the speed, range and flexibility of these light units, all equipped with radios, led to refined tactics, and these tanks were deployed in efficient screening-scouting duties. They performed well, despite heavy losses. In 1941, they took part in operation Marita (the Balkans campaign) and the invasion of Greece. Many were sent to the Afrika Korps, were their speed was seen as an advantage on this particular barren landscape. Variants of the Panzer II (the Wespe and Marder II) were also shipped to Africa. Some survived, despite losses and few replacements, until the Axis surrendered in Tunisia. When the Russian invasion took place in the summer of 1941, 782 Panzer IIs were involved, now organised in scout units. But the lack of armor proved to be a serious issue. Many Ausf.Cs were up-armored and retrofitted with extra plates. The Ausf.F was a largely rebuilt variant with overall added protection. Ammunition was mixed with more and more AP shells, notably tungsten-core rounds. But most Russian tanks proved immune to them, and only some T-26s and various light tanks could be disabled at short range, by experienced crews. When they could, the Panzer II tankers avoided tank-to-tank combat. In 1942, most of the survivors were removed from the frontline, or given to allied nations, like the Slovaks and Bulgarians. Some were converted, others led to various unsuccessful prototype conversions. Notable among these are the recovery Bergenpanzer II and the Flak 38 version. Production turned towards the Wespe and Marder II. In 1943-44, only the Luchs was active, in limited numbers, alongside survivors of the previous campaigns (386 by October 1944). There are records of 145 Panzer II still active by March 1945. Of the 22 IIJs only 7 were issued to the 12th Panzer Division. It is spelled Brückenleger, not Brükenleger. This seems to be basically the Wikipedia article taken and re-worded with inferior verbiage to a different article. Except that you repeat the exact same paragraphs multiple times which gets pretty annoying after a while. You don’t have to write each section on each variant as a stand-alone piece, just describe what makes that variant DIFFERENT from the others. We don’t need to hear 6 times about how the Pz.II didn’t serve in the Spanish CIvil War, and first served in Poland in 1939, etc. Also, to say that the armor “was not immune” to 37mm fire suggests that it at least RESISTS it. It doesn’t. Generally a 37mm AP shot will go right through 14mm of armor like it was sheet metal. “Not immune” is an understatement. 14mm of armor is basically powerless against a 37mm shot; probably even HE shells would penetrate it. Possibly very glancing hits would be at least partially deflected. The basic rule of thumb is that armor needs to be roughly the same thickness as the diameter of shot you are trying to block. So 14mm of armor would be useful against .50cal rounds…but AP rounds would probably still penetrate it. To stop 37mm you need 40-50mm of armor. A cruiser with 8″ guns usually gets roughly 8″ of armor, and can stop shells of roughly the same caliber. A battleship gets 16-20″ of armor (it varies a lot, of course). The article was written four years ago before our standards were significantly higher starting around 2016. It is in the process of being rewritten and chopped into separate separate articles. One of our latest articles is on the Pz. II Ausf. G actually and more articles on each Pz. II variant will come eventually. On everyone of our articles, it features a source list. It indeed says Wikipedia as one. Lastly, this article will receive a little banner warning visitors that the article is outdated and may contain inaccuracies. Thanks for the criticisms. The Panzer II L. specification tab has, the typo 601 km/h.